Our first t-shirt and you can have it in any color you like as long as you like “Bio Diesel Yellow.” The shirt was created by BCBB and The Splinter Group, then printed by TS Designs in Burlington, NC. The men’s shirts are “dirt to shirt” - grown, made and printed in North Carolina. The women’s shirts are all organic cotton (TS Designs doesn’t offer women’s cut shirts from NC grown cotton yet), but they are printed in North Carolina and all have water based dyes, good for the environment. These shirts are sturdy, thick cotton and very soft top quality. Made in NC. Pre-shrunk. Our second t-shirt is now available and you can have it in any color you like as long as you like off-black. This shirt was also created by BCBB and The Splinter Group, then printed by TS Designs in Burlington, NC. These shirts are sturdy and very soft, top quality. If you remember back to the days of the Ramones, Blondie, the Cramps, the Misfits and the Fleshtones, or bands like 10,000 Maniacs, Patti Smith and the Talking Heads, they all played at the NY nightclub CBGB on Bleecker Street in Manhattan. We pay hommage to the birthplace of punk rock and new wave music with our own BCBB version. Home of the Golden Bull. Made in NC. Pre-shrunk. Our onesie is made by TS Designs and also 100% NC cotton. We have just one color, beige and three sizes. These are available in 3-6 month; 6-12 month and 12-18 month. Made in NC. The exact sauces we make in the restaurant with the same high quality standards. All packaged in 12 ounce glass jars with faux flip tops to look like cans of beer. Made just like the sauces we serve everyday in the restaurant. Please sauce liberally, never in moderation. The beer in these sauces will not get you sauced. Made in NC. Forget the Rocky Mountain Oysters... You want Bull Nuts! 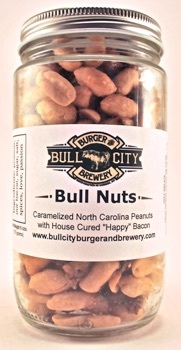 Bull City Burger and Brewery presents our most popular snack - Bull Nuts. They’re the perfect snack. Bull Nuts are NC peanuts with caramelized sugar, house cured and smoked bacon bits, salt, sugar and secret spices. That’s it. They are sweet and salty. They’re crunchy and chewy. They aren’t Schweddy balls or even salty chocolate balls. They’re bull nuts! The perfect snack at the bar, home, a cocktail party, tailgating, and all around munching. No additives. No fillers. An excellent source of flavor. You choose the value and we’ll send it out. We suggest $30 for two adults with a round beer. If you need more than $75, call us!